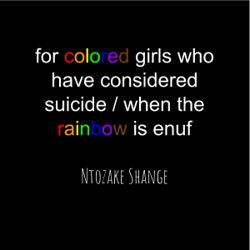 For Colored Girls Who Have Considered Suicide / When the Rainbow is Enuf is a choreopoem by Ntozake Shange, Premiering in 1976 in Berkeley, California, For Colored Girls… was Ntozake’s first and most widely produced work. The poem follows seven nameless woman through a world of racism, oppression, and sexism. These women of color are named after the colors of the rainbow: Lady in Red, Lady in Blue, Lady in Purple, Lady in Yellow, Lady in Brown, Lady in Green, and Lady in Orange. They tell their stories and the stories of other women they know through poetry, music, and dance. It is a piece that flows effortlessly from one story into the next, never really taking a moment to breathe. The women often help each other tell their stories by acting as a chorus or stepping into the shoes of another character. For Colored Girls… became a revolution for actresses of color and made its way from a tiny theater in Berkeley to New York City where it became the second play by a black woman to reach Broadway. The 20 poems that make up the piece are complex, rhythmic, delicate, rough, violent, and fragile. The physicality and rhythm are just as vital to understanding what the women are going through as the words they speak.